Not to be confused with Lunar orbit (the orbit of an object around the Moon). The Moon orbits Earth in the prograde direction and completes one revolution relative to the stars in about 27.32 days (a sidereal month) and one revolution relative to the Sun in about 29.53 days (a synodic month). Earth and the Moon orbit about their barycenter (common center of mass), which lies about 4,600 km (2,900 mi) from Earth's center (about 3/4 of the radius of Earth). On average, the distance to the Moon is about 385,000 km (239,000 mi) from Earth's center, which corresponds to about 60 Earth radii. The properties of the orbit described in this section are approximations. The Moon's orbit around Earth has many irregularities (perturbations), the study of which (lunar theory) has a long history. Moon's orbit and sizes of Earth and Moon to scale. While the orbit of the Moon is a nearly circular ellipse (the semimajor and -minor axes are 384,400 km and 383,800 km, respectively; a difference of only 0.14%), the equation of the ellipse yields an eccentricity of 0.0549 and perigee and apogee distances of 362,600 km and 405,400 km, respectively (a difference of 12%). Thus the Moon's apparent size changes as it moves towards and away from an observer on Earth and, due to Kepler's second law, the Moon's tangential and angular speeds change. The mean angular movement relative to an imaginary observer at the Earth-Moon barycentre is 7001131760000000000♠13.176° per day to the east (Julian day 2000). The Moon's elongation is its angular distance east of the Sun at any time. At new moon, it is zero and the Moon is said to be in conjunction. At full moon, the elongation is 180° and it is said to be in opposition. In both cases, the Moon is in syzygy, that is, the Sun, Moon and Earth are nearly aligned. When elongation is either 90° or 270°, the Moon is said to be in quadrature. Apsidal precession—The major axis of Moon's elliptical orbit rotates by one complete revolution once every 8.85 years. The Moon's elliptical orbit is vastly exaggerated from its almost circular shape to make the precession visible. 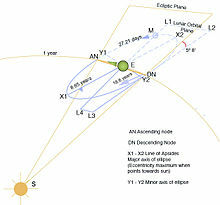 Orbital inclination—the Moon's orbit is inclined by 5.14° to the ecliptic. The orientation of the orbit is not fixed in space, but rotates over time. This orbital precession is also called apsidal precession and is the rotation of the Moon's orbit within the orbital plane, i.e. the axes of the ellipse change direction. The Moon's major axis – the longest diameter of the orbit, joining its nearest and farthest points, the perigee and apogee, respectively – makes one complete revolution every 8.85 Earth years, or 3,232.6054 days, as it rotates slowly in the same direction as the Moon itself (direct motion). The Moon's apsidal precession is distinct from the nodal precession of its orbital plane and axial precession of moon itself. The mean inclination of the lunar orbit to the ecliptic plane is 5.145°. Theoretical considerations show that the present inclination relative to the ecliptic plane arose by tidal evolution from an earlier near-Earth orbit with a fairly constant inclination relative to Earth's equator. It would require an inclination of this earlier orbit of about 10° to the equator to produce a present inclination of 5° to the ecliptic. It is thought that originally the inclination to the equator was near zero, but it could have been increased to 10° through the influence of planetesimals passing near the Moon while falling to the Earth. If this had not happened, the Moon would now lie much closer to the ecliptic and eclipses would be much more frequent. The rotational axis of the Moon is not perpendicular to its orbital plane, so the lunar equator is not in the plane of its orbit, but is inclined to it by a constant value of 6.688° (this is the obliquity). As was discovered by Jacques Cassini in 1722, the rotational axis of the Moon precesses with the same rate as its orbital plane, but is 180° out of phase (see Cassini's Laws). Therefore, the angle between the ecliptic and the lunar equator is always 1.543°, even though the rotational axis of the Moon is not fixed with respect to the stars. The nodes are points at which the Moon's orbit crosses the ecliptic. The Moon crosses the same node every 27.2122 days, an interval called the draconic or draconitic month. The line of nodes, the intersection between the two respective planes, has a retrograde motion: for an observer on Earth, it rotates westward along the ecliptic with a period of 18.60 years or 19.3549° per year. When viewed from the celestial north, the nodes move clockwise around Earth, opposite to Earth's own spin and its revolution around the Sun. Lunar and solar eclipses can occur when the nodes align with the Sun, roughly every 173.3 days. Lunar orbit inclination also determines eclipses; shadows cross when nodes coincide with full and new moon when the Sun, Earth, and Moon align in three dimensions. In effect, this means that the "tropical year" on the Moon is only 347 days long. This is called the draconic year or eclipse year. The "seasons" on the Moon fit into this period. For about half of this draconic year, the Sun is north of the lunar equator (but at most 1.543°), and for the other half, it is south of the lunar equator. Obviously, the effect of these seasons is minor compared to the difference between lunar night and lunar day. At the lunar poles, instead of usual lunar days and nights of about 15 Earth days, the Sun will be "up" for 173 days as it will be "down"; polar sunrise and sunset takes 18 days each year. "Up" here means that the centre of the Sun is above the horizon. Lunar polar sunrises and sunsets occur around the time of eclipses (solar or lunar). For example, at the Solar eclipse of March 9, 2016, the Moon was near its descending node, and the Sun was near the point in the sky where the equator of the Moon crosses the ecliptic. When the Sun reaches that point, the centre of the Sun sets at the lunar north pole and rises at the lunar south pole. Every 18.6 years, the angle between the Moon's orbit and Earth's equator reaches a maximum of 28°36′, the sum of Earth's equatorial tilt (23°27′) and the Moon's orbital inclination (5°09′) to the ecliptic. This is called major lunar standstill. Around this time, the Moon's declination will vary from −28°36′ to +28°36′. Conversely, 9.3 years later, the angle between the Moon's orbit and Earth's equator reaches its minimum of 18°20′. This is called a minor lunar standstill. The last lunar standstill was a minor standstill in October 2015. At that time the descending node was lined up with the equinox (the point in the sky having right ascension zero and declination zero). The nodes are moving west by about 19° per year. The Sun crosses a given node about 20 days earlier each year. When the inclination of the Moon's orbit to the Earth's equator is at its minimum of 18°20′, the centre of the Moon's disk will be above the horizon every day from latitudes less than 71°40' (90° − 18°20') north or south. When the inclination is at its maximum of 28°36', the centre of the Moon's disk will be above the horizon every day only from latitudes less than 61°24' (90° − 28°36') north or south. At higher latitudes, there will be a period of at least one day each month when the Moon does not rise, but there will also be a period of at least one day each month when the Moon does not set. This is similar to the seasonal behaviour of the Sun, but with a period of 27.2 days instead of 365 days. Note that a point on the Moon can actually be visible when it is about 34 arc minutes below the horizon, due to atmospheric refraction. Because of the inclination of the Moon's orbit with respect to the Earth's equator, the Moon is above the horizon at the North and South Pole for almost two weeks every month, even though the Sun is below the horizon for six months at a time. The period from moonrise to moonrise at the poles is a tropical month, about 27.3 days, quite close to the sidereal period. When the Sun is the furthest below the horizon (winter solstice), the Moon will be full when it is at its highest point. When the Moon is in Gemini it will be above the horizon at the North Pole, and when it is in Sagittarius it will be up at the South Pole. The Moon's light is used by zooplankton in the Arctic when the Sun is below the horizon for months and must have been helpful to the animals that lived in Arctic and Antarctic regions when the climate was warmer. Scale model of the Earth–Moon system: Sizes and distances are to scale. It represents the mean distance of the orbit and the mean radii of both bodies. About 1000 BC, the Babylonians were the first human civilization known to have kept a consistent record of lunar observations. Clay tablets from that period, which have been found over the territory of present-day Iraq, are inscribed with cuneiform writing recording the times and dates of moonrises and moonsets, the stars that the Moon passed close by, and the time differences between rising and setting of both the Sun and the Moon around the time of the full moon. Babylonian astronomy discovered the three main periods of the Moon's motion and used data analysis to build lunar calendars that extended well into the future. This use of detailed, systematic observations to make predictions based on experimental data may be classified as the first scientific study in human history. However, the Babylonians seem to have lacked any geometrical or physical interpretation of their data, and they could not predict future lunar eclipses (although "warnings" were issued before likely eclipse times). Ancient Greek astronomers were the first to introduce and analyze mathematical models of the motion of objects in the sky. Ptolemy described lunar motion by using a well-defined geometric model of epicycles and evection. Sir Isaac Newton was the first to develop a complete theory of motion, mechanics. The sheer wealth of humanity's observations of the lunar motion was the main testbed of his theory. There are several different periods associated with the lunar orbit. The sidereal month is the time it takes to make one complete orbit around Earth with respect to the fixed stars. It is about 27.32 days. The synodic month is the time it takes the Moon to reach the same visual phase. This varies notably throughout the year, but averages around 29.53 days. The synodic period is longer than the sidereal period because the Earth–Moon system moves in its orbit around the Sun during each sidereal month, hence a longer period is required to achieve a similar alignment of Earth, the Sun, and the Moon. The anomalistic month is the time between perigees and is about 27.55 days. The Earth–Moon separation determines the strength of the lunar tide raising force. The draconic month is the time from ascending node to ascending node. The time between two successive passes of the same ecliptic longitude is called the tropical month. The latter three periods are slightly different from the sidereal month. The average length of a calendar month (a twelfth of a year) is about 30.4 days. This is not a lunar period, though the calendar month is historically related to the visible lunar phase. The Moon's distance from Earth and Moon phases in 2014. The gravitational attraction that the Moon exerts on Earth is the cause of tides in the sea; the Sun has a smaller tidal influence. If Earth had a global ocean of uniform depth, the Moon would act to deform both the solid Earth (by a small amount) and the ocean in the shape of an ellipsoid with the high points roughly beneath the Moon and on the opposite side of Earth. However, because of the presence of the continents, Earth's much faster rotation and varying ocean depths, this simplistic visualisation does not happen. Although the tidal flow period is generally synchronized to the Moon's orbit around Earth, its relative timing varies greatly. In some places on Earth, there is only one high tide per day, whereas others such as Southampton have four, though this is somewhat rare. The notional tidal bulges are carried ahead of the Earth–Moon orientation by the continents as a result of Earth's rotation. The eccentric mass of each bulge exerts a small amount of gravitational attraction on the Moon, with the bulge on the side of Earth closest to the Moon pulling in a direction slightly forward along the Moon's orbit (because Earth's rotation has carried the bulge forward). The bulge on the side furthest from the Moon has the opposite effect, but because the gravitational attraction varies inversely with the square of distance, the effect is stronger for the near-side bulge. As a result, some of Earth's angular (or rotational) momentum is gradually being transferred to the rotation of the Earth–Moon pair around their mutual centre of mass, called the barycentre. This slightly faster rotation causes the Earth–Moon distance to increase at approximately 38 millimetres per year. Conservation of angular momentum means that Earth's axial rotation is gradually slowing, and because of this its day lengthens by approximately 23 microseconds every year (excluding glacial rebound). Both figures are valid only for the current configuration of the continents. Tidal rhythmites from 620 million years ago show that, over hundreds of millions of years, the Moon receded at an average rate of 22 mm (0.87 in) per year (2200 km or 0.56% or the Earth-moon distance per hundred million years) and the day lengthened at an average rate of 12 microseconds per year (or 20 minutes per hundred million years), both about half of their current values. The present high rate may be due to near resonance between natural ocean frequencies and tidal frequencies. See also tidal acceleration for a more detailed description. The Moon is gradually receding from Earth into a higher orbit, and calculations suggest that this would continue for about 50 billion years. By that time, Earth and the Moon would be in a mutual spin–orbit resonance or tidal locking, in which the Moon will orbit Earth in about 47 days (currently 27 days), and both the Moon and Earth would rotate around their axes in the same time, always facing each other with the same side. This has already happened to the Moon—the same side always faces Earth—and is also slowly happening to the Earth. However, the slowdown of Earth's rotation is not occurring fast enough for the rotation to lengthen to a month before other effects change the situation: approximately 2.3 billion years from now, the increase of the Sun's radiation will have caused Earth's oceans to evaporate, removing the bulk of the tidal friction and acceleration. Animation of the Moon as it cycles through its phases. The apparent wobbling of the Moon is known as libration. The Moon is in synchronous rotation, meaning that it keeps the same face toward Earth at all times. This synchronous rotation is only true on average, because the Moon's orbit has a definite eccentricity. As a result, the angular velocity of the Moon varies as it orbits Earth and hence is not always equal to the Moon's rotational velocity. When the Moon is at its perigee, its rotation is slower than its orbital motion, and this allows us to see up to eight degrees of longitude of its eastern (right) far side. 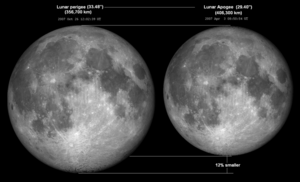 Conversely, when the Moon reaches its apogee, its rotation is faster than its orbital motion and this reveals eight degrees of longitude of its western (left) far side. This is referred to as longitudinal libration. Because the lunar orbit is also inclined to Earth's ecliptic plane by 5.1°, the rotational axis of the Moon seems to rotate towards and away from Earth during one complete orbit. This is referred to as latitudinal libration, which allows one to see almost 7° of latitude beyond the pole on the far side. Finally, because the Moon is only about 60 Earth radii away from Earth's centre of mass, an observer at the equator who observes the Moon throughout the night moves laterally by one Earth diameter. This gives rise to a diurnal libration, which allows one to view an additional one degree's worth of lunar longitude. For the same reason, observers at both of Earth's geographical poles would be able to see one additional degree's worth of libration in latitude. When viewed from the north celestial pole (i.e., from the approximate direction of the star Polaris) the Moon orbits Earth anticlockwise and Earth orbits the Sun anticlockwise, and the Moon and Earth rotate on their own axes anticlockwise. The right-hand rule can be used to indicate the direction of the angular velocity. If the thumb of the right hand points to the north celestial pole, its fingers curl in the direction that the Moon orbits Earth, Earth orbits the Sun, and the Moon and Earth rotate on their own axes. In representations of the Solar System, it is common to draw the trajectory of Earth from the point of view of the Sun, and the trajectory of the Moon from the point of view of Earth. This could give the impression that the Moon orbits Earth in such a way that sometimes it goes backwards when viewed from the Sun's perspective. Because the orbital velocity of the Moon around Earth (1 km/s) is small compared to the orbital velocity of Earth about the Sun (30 km/s), this never happens. There are no rearward loops in the Moon's solar orbit. Considering the Earth–Moon system as a binary planet, its centre of gravity is within Earth, about 4,624 km (2,873 mi) or 72.6% of the Earth's radius from the centre of the Earth. This centre of gravity remains on the line between the centres of the Earth and Moon as the Earth completes its diurnal rotation. The path of the Earth–Moon system in its solar orbit is defined as the movement of this mutual centre of gravity around the Sun. Consequently, Earth's centre veers inside and outside the solar orbital path during each synodic month as the Moon moves in its orbit around the common centre of gravity. The Sun's gravitational effect on the Moon is more than twice that of Earth's on the Moon; consequently, the Moon's trajectory is always convex (as seen when looking Sunward at the entire Sun–Earth–Moon system from a great distance outside Earth–Moon solar orbit), and is nowhere concave (from the same perspective) or looped. That is, the region enclosed by the Moon's orbit of the Sun is a convex set. ^ M. Chapront-Touzé; J. Chapront (1983). "The lunar ephemeris ELP-2000". Astronomy & Astrophysics. 124: 54. Bibcode:1983A&A...124...50C. ^ M. Chapront-Touzé; J. Chapront (1988). "ELP2000-85: a semi-analytical lunar ephemeris adequate for historical times". Astronomy & Astrophysics. 190: 351. Bibcode:1988A&A...190..342C. ^ This often quoted value for the mean distance is actually the inverse of the mean of the inverse of the distance, which is not the same as the mean distance itself. ^ a b Jean Meeus, Mathematical astronomy morsels (Richmond, VA: Willmann-Bell, 1997) 11–12. ^ Lang, Kenneth R. (2011), The Cambridge Guide to the Solar System, 2nd ed., Cambridge University Press. ^ "Moon Fact Sheet". NASA. Retrieved 2014-01-08. ^ a b c d Martin C. Gutzwiller (1998). "Moon-Earth-Sun: The oldest three-body problem". Reviews of Modern Physics. 70 (2): 589–639. Bibcode:1998RvMP...70..589G. doi:10.1103/RevModPhys.70.589. ^ Peter Goldreich (Nov 1966). "History of the Lunar Orbit". Reviews of Geophysics. Bibcode:1966RvGSP...4..411G. doi:10.1029/RG004i004p00411. Jihad Touma & Jack Wisdom (Nov 1994). "Evolution of the Earth-Moon system". The Astronomical Journal. Bibcode:1994AJ....108.1943T. doi:10.1086/117209. ^ Jacob Aron (Nov 28, 2015). "Flying gold knocked the moon off course and ruined eclipses". New Scientist. ^ "View of the Moon". U. of Arkansas at Little Rock. Retrieved May 9, 2016. ^ Calculated from arcsin(0.25°/1.543°)/90° times 173 days, since the angular radius of the Sun is about 0.25°. ^ "Moonlight helps plankton escape predators during Arctic winters". New Scientist. Jan 16, 2016. ^ The periods are calculated from orbital elements, using the rate of change of quantities at the instant J2000. The J2000 rate of change equals the coefficient of the first-degree term of VSOP polynomials. In the original VSOP87 elements, the units are arcseconds(”) and Julian centuries. There are 1,296,000” in a circle, 36525 days in a Julian century. The sidereal month is the time of a revolution of longitude λ with respect to the fixed J2000 equinox. VSOP87 gives 1732559343.7306” or 1336.8513455 revolutions in 36525 days–27.321661547 days per revolution. The tropical month is similar, but the longitude for the equinox of date is used. For the anomalistic year, the mean anomaly (λ-ω) is used (equinox does not matter). For the draconic month, (λ-Ω) is used. For the synodic month, the sidereal period of the mean Sun (or Earth) and the Moon. The period would be 1/(1/m-1/e). VSOP elements from Simon, J.L. ; Bretagnon, P.; Chapront, J.; Chapront-Touzé, M.; Francou, G.; Laskar, J. (February 1994). "Numerical expressions for precession formulae and mean elements for the Moon and planets". Astronomy and Astrophysics. 282 (2): 669. Bibcode:1994A&A...282..663S. ^ Jean Meeus, Astronomical Algorithms (Richmond, VA: Willmann-Bell, 1998) p 354. From 1900–2100, the shortest time from one new moon to the next is 29 days, 6 hours, and 35 min, and the longest 29 days, 19 hours, and 55 min. ^ C.D. Murray; S.F. Dermott (1999). Solar System Dynamics. Cambridge University Press. p. 184. ^ a b The reference by H. L. Vacher (2001) (details separately cited in this list) describes this as 'convex outward', whereas older references such as "The Moon's Orbit Around the Sun, Turner, A. B. Journal of the Royal Astronomical Society of Canada, Vol. 6, p. 117, 1912JRASC...6..117T"; and "H Godfray, Elementary Treatise on the Lunar Theory" describe the same geometry by the words concave to the sun. ^ a b c Aslaksen, Helmer (2010). "The Orbit of the Moon around the Sun is Convex!". Retrieved 2006-04-21. ^ Vacher, H.L. (November 2001). "Computational Geology 18 – Definition and the Concept of Set" (PDF). Journal of Geoscience Education. 49 (5): 470–479. Retrieved 2006-04-21.